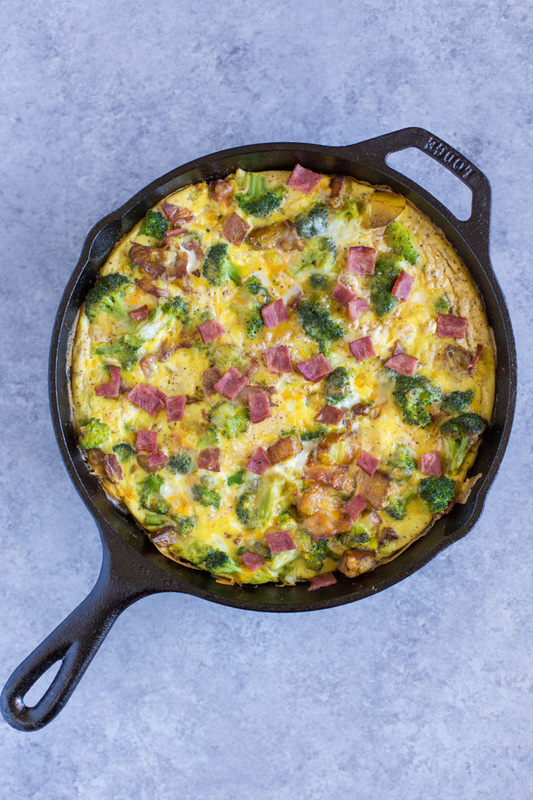 Cheesy Broccoli and Potato Frittata is a fast, easy, one-pan meal, perfect for busy week nights and weekend brunches. 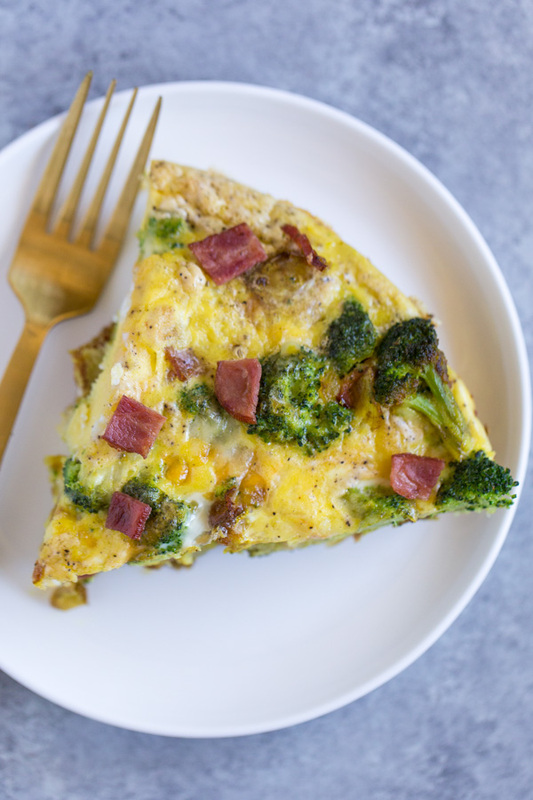 If you like breakfast casseroles, you’ll love this frittata! Need an easy meal that comes together in one pan? 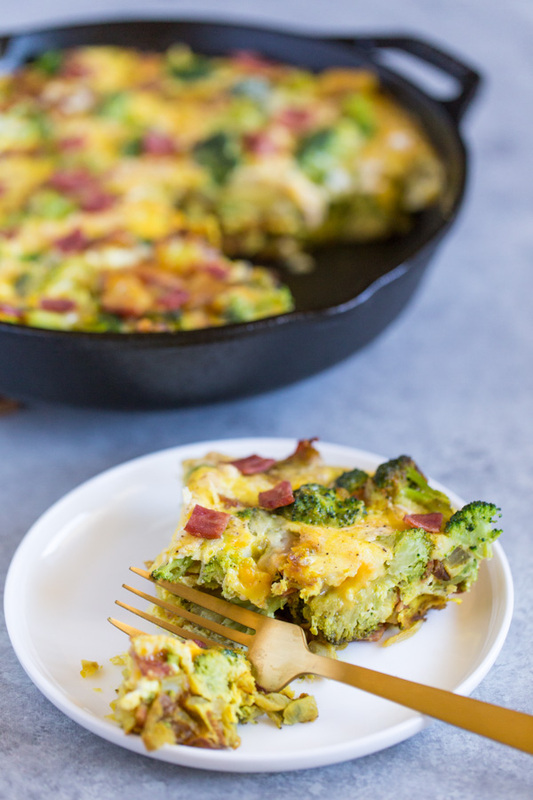 Cheesy Broccoli and Potato Frittata is the answer. I’ve talked before about my love for frittatas. They’re the perfect throw together meal when you need to clean out your fridge. The veggie/protein/cheese options are endless, but this broccoli & potato version is my favorite. Maybe because it reminds me of a loaded baked potato?! 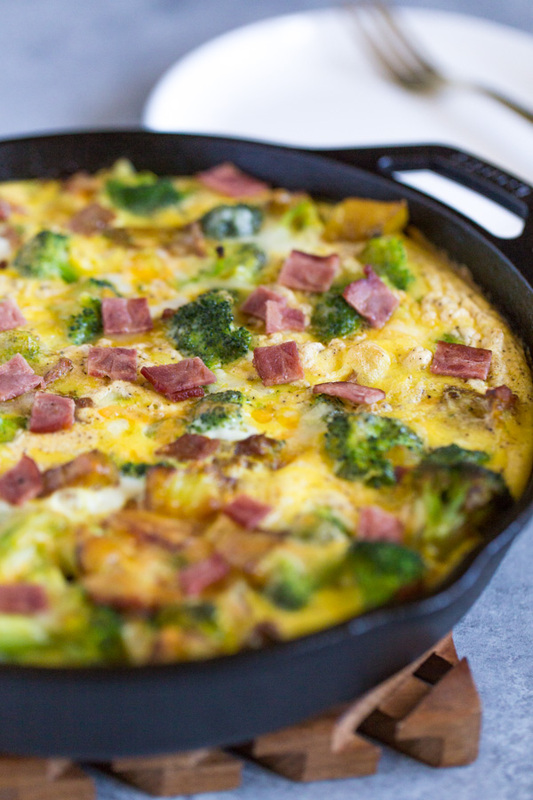 All you need to make this are a couple potatoes, an onion, broccoli, turkey bacon, eggs, and cheese. I add a bit of turmeric to boost the golden yellow color and add some powerful anti-oxidant power to the frittata! Serve it up with a side salad and slices of toast or crusty bread and you’ve got yourself a complete meal. Enjoy! In a medium skillet, cook bacon. Remove from skillet and set aside. In the same skillet, heat oil. Add potatoes and cook until browned on the outside and tender on the inside, about 10 minutes. Add onion to skillet and cook additional 2-3 minutes until translucent. Add broccoli, bacon, salt, pepper, and turmeric to potato & onion mixture and stir to combine. Spread shredded cheese on top of veggie mixture. Pour eggs on top of veggie and cheese mixture. Reduce heat to medium low after you add the eggs. Do not stir. Let cook 2-3 minutes or until edges of eggs just begin to set. Transfer skillet to hot oven to finish cooking, about 20 minutes or until the center of frittata is firm and puffed.